Bollywood’s sonic throwback started with The Dirty Picture. The five most popular songs of 2011, according the Bollywood website Koimoi.com were, Chammak Challo sung by hip hop sensation Akon, in Ra.One; Dhinka Chika, from Ready, sung by the Mika Singh and Amrita Kak; Sadda Haq by Mohit Chauhan in Rockstar; and in a departure from this post-millenial list of singers, The Dirty Picture’s Ooh La La, sung by the gold plated Disco King from the ’80s, Bappi Lahiri. Of course TDP was set in the pulp film industry of the ’80s, so who better than Bappida for its soundtrack? A man whose voice and compositions made the entire decade groove in all its sparkly, kitschy glory. Last month, within the first few minutes of Dum Laga Ke Haisha, Kumar Sanu’s nasal humming wafted through the film and became a portkey that yanked the audience straight into the ’90s, the decade in which the film is set. Sanu looms larger over Dum Laga Ke Haisha and even has a cameo in the film. Rajma ke baad, thoda aa jaata hai fart. Are iconic but over-the-hill voices enjoying a cultural moment? Did filmmakers suddenly wake up and realise that Kumar Sanu, Altaf Raja and Bappi Lahiri still have ‘it’? If this is a trend that has any durability, we are in for some fun. At least our films are now mining their own repertoire, instead of copying K-pop. But it’s possible that the resurgence we are witnessing of almost-vintage voices is a reaction to the anodyne singing that fills Bollywood today. There is a whole crop of singers today who sing very well, but aren’t memorable, particularly among the women. When Mohammad Rafi or Kishore Kumar sang, you didn’t need to Google the track list to figure out whose voice it was. But with an Arijit Singh, Benny Dayal, Ankit Tiwari and Mohit Chauhan, the lines often get blurred. Shreya Ghoshal merges into Monali Thakur. With songs like “Galiyan” and “Titli”, we have seen a return to melody in movies after years of autotuned mediocrity , but we still don’t have voices that leave a mark. There are some exceptions to this rule. There’s Amit Trivedi. But that is because he sings every song the same way. Also Farhan Akhtar, whose distinctive hoarseness marks him out. But these are few and singing is not either Trivedi or Akhtar’s day job. 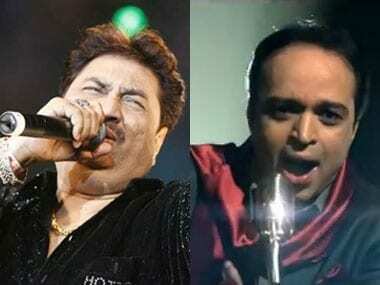 Although they hit the notes perfectly, the problem with the current generation of Hindi playback singers is that their voices do not cue a world, like Kumar Sanu’s does. This could be due to excessive reliance on technology, which smoothens out every chink in the singing. Every song sounds so overproduced and perfect nowadays that you could almost believe it was sung by a robot. Which explains why, when you hear them ‘unplugged’, you feel a twinge of dissonance: “Why is the singer breathing/gulping/improvising so much?” It’s like seeing an actor on a magazine cover, photoshopped to death and then seeing a candid picture of them where they have laugh lines or, god forbid, pores. There’s nothing wrong with laugh lines or pores. They’re signs of someone having lived and learnt from life, which really shouldn’t be a bad thing. By the same token, there is nothing wrong with a distinctive voice. Despite Ila Arun’s singing career, it is possible to be memorable without giving up on versatility. Some of our most beloved playback singers had voices that were far from perfect: remember KL Saigal and Mukesh? Let’s hope the upcoming batch of singers take a leaf out of Bappi-da and Altaf Raja’s books, and add a little personality to their pitch-perfect voices. Maybe that way we won’t have to keep exhuming singers from a bygone era.